Check out Paul, The Freedom Fighter! 1) What is the significance of Saul’s blindness lasting for 3 days (verse 9)? 2) As we read in yesterday’s journey study, Saul was a Pharisee well-trained in praying. How might his prayers have been different during his time of blindness and waiting? 3) What might have Ananias been feeling when Jesus called him to go to Saul? 4) What does Jesus mean in verses 15 and 16? What is His mission for Saul? “Here I am, Lord,” he replied. 18 At once something like scales fell from his eyes, and he regained his sight. Then he got up and was baptized. 19 And after taking some food, he regained his strength. We may read this as a small detail, but this would have been significant for Ananias and the original readers of Acts. In Matthew 12, the Pharisees asked Jesus for a sign. He answers that the only sign to be given is the sign of Jonah: “For as Jonah was in the belly of the huge fish three days and three nights, so the Son of Man will be in the heart of the earth three days and three nights.” (Matthew 12:40) The people didn’t understand what Jesus meant at the time, but after His resurrection and ascension it all became clear to the believers. Ananias would have recognized the parallel between the 3 days that Jonah spent in the belly of the whale, the 3 days that Jesus spent in the grave and the 3 days that Saul spent in darkness. Scripture doesn’t say exactly why Saul was blinded, but it likely wasn’t meant as a punishment, but was a result of his intense encounter with Jesus. Those 3 days were spent in reflection and prayer before he began his new life in Christ. The Pharisees followed the law to the letter, including in their prayer life. Pride was at the heart of their prayers. In Luke 18 Jesus tells a parable of a Pharisee and a tax collector. The Pharisee prays aloud: “‘God, I thank you that I’m not like other people—greedy, unrighteous, adulterer, or even like this tax collector. 12 I fast twice a week; I give a tenth of everything I get.” (Luke 18:11-12) In Matthew 6, Jesus instructs His listeners not to pray like the Pharisees. Instead, He says, “But when you pray, go into your private room, shut your door, and pray to your Father who is in secret. And your Father who sees in secret will reward you.” (Matthew 6:5-6) Isn’t this a picture of Saul during the 3 days he spent blind? God saw him in the secret of Saul’s blindness and sent his reward in the form of Ananias and the Holy Spirit. We get a peek into what Ananias might have been feeling in verses 13 and 14. He was afraid! Ananias is not being unreasonable. He had heard of this man Saul and he was the last person Ananias wanted to visit! Why would he put himself (and possibly his friends and family) at risk to go to this man? Just two chapters before, we read about the first martyr – the stoning of Stephen (Acts 7:54-60). The very next verse said Saul approved of putting him to death! Sometimes being obedient to God’s call is risky. Ananias knew the danger, but he was obedient to what was commanded of him. He was so confident in God’s plan that he called Saul “brother”! In God’s perfect wisdom, He does the unexpected. He chose Saul to be the instrument He would use to carry the Gospel into the world. Not one of the apostles or original disciples, but Saul, an enemy of The Way. Jesus tells Ananias that Saul would bring the Gospel to not only the Israelites, but to Gentiles and kings. God knew how Saul was uniquely equipped to bring the Gospel to the Gentiles, rather than one of His apostles, like Peter or John, but God’s plan wouldn’t be without hardship. Jesus tells Ananias that Saul will suffer for the Gospel. Indeed, we see throughout Acts and Paul’s letters that he endures much suffering for the sake of Christ. 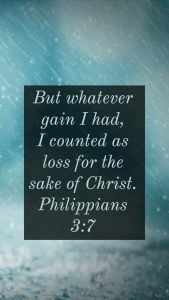 “Because of him I have suffered the loss of all things and consider them as dung, so that I may gain Christ,” (Philippians 3:8). Following God’s call doesn’t mean an easy path for Saul, but the suffering he endures pales in comparison to the joy he has in Christ. Have you spent time reflecting on the 3 days Jesus spent in the grave? It’s easy for us to speed-read through the end of the gospels and forget to pause and remember. We read about Jesus’ brutal death and jump right to His resurrection. Don’t we all love to read about his encounter with Mary in the garden? (John 20:11-18) Saul knew all about Jesus and what His disciples had claimed. I suspect much of his 3 days of blindness were spent reflecting on the 3 days Jesus spent in darkness. Let us not fail to remember the weight of Jesus’ death and the miracle of His resurrection on which our faith hinges! Have you prayed “Pharisee” prayers? Were you a “church kid”, so you know the right words to say, but you don’t mean it in your heart. When was the last time you talked to God in secret? Maybe you don’t even know where to start when it comes to talking to God. Take heart, you are not alone! Jesus assured His followers, “your Father knows the things you need before you ask him.” (Matthew 6:8) Instead, Jesus gives us guidance for how to pray in the form of the Lord’s Prayer just a few verses later (verses 9-13). When you don’t know what to pray, start here. 3) What might have Ananias been feeling when Jesus called him to go to Saul?What might God be calling you to do that doesn’t make sense? Maybe there’s even risk involved. Are you afraid of what being obedient might mean for your life? Remember that God’s ways are always greater than ours and we can trust Him to be faithful to His perfect plan. Similarly, is there anyone you feel like is unredeemable? Can you think of someone so far from Christ it seems they will never come to Him? Take encouragement from Saul’s conversion! Saul was the last person the early church expected to become a Christian, let alone become one of the most influential people in history for the sake of Christ! No one is too far from Christ to come to salvation. Just as God had a plan for Saul, He has a specific plan and purpose for us. It might be difficult and it will involve suffering (John 16:33). But we read in James that our trials for the sake of Christ will not return void. “Consider it a great joy, my brothers and sisters, whenever you experience various trials, 3 because you know that the testing of your faith produces endurance. 4 And let endurance have its full effect, so that you may be mature and complete, lacking nothing.” (James 1:2-4) Mature and complete. Lacking nothing. Isn’t that what we desire as Christians? Be encouraged by Paul, James, Peter, and other leaders of the early Church. God’s plan is perfect, and it includes you! 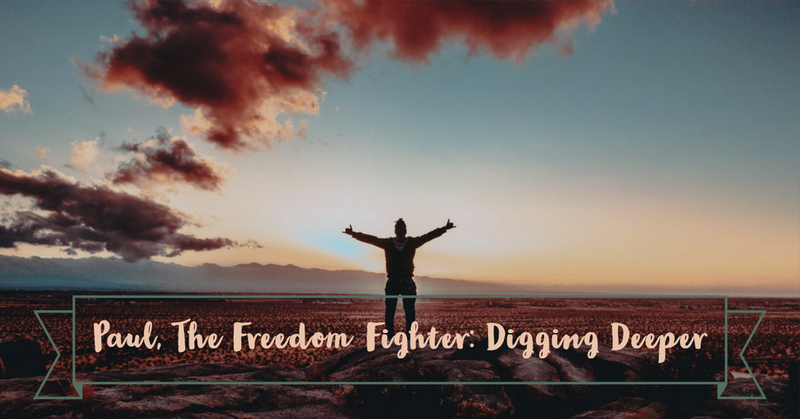 Catch up with Paul, The Freedom Fighter!